We can all agree that Commercial Motor Vehicle accidents expose the company’s liability to Bodily Injury, Property Damage and Cargo Damage claims. This is why the Federal Motor Carrier Safety Administration requires Motor Carriers to have minimum levels of financial responsibility as set forth in Part 387.9 of the Regulations. The level of financial responsibility depends on the product being transported and whether moving in interstate or intrastate commerce. These levels can range from $750,000.00 to $5,000,000.00. Keep in mind that these are minimum levels. Many motor carriers have higher amounts of coverage depending on the level of exposure they are willing to tolerate or afford. Liability/Insurance Companies issue policies for these levels of coverage and have strict guidance for accident reporting. The reason for this guidance is for their policy holders to quickly provide information to Insurance Adjusters who are responsible to minimize the impact to the insured’s liability while determining Cash Reserves to handle anticipated claims. Time is of the essence for these Adjusters to “place the wheels in motion” establishing the accident file. This includes the assignment of Field Adjusters to inspect damage, take written statements and procure Police Accident Reports. 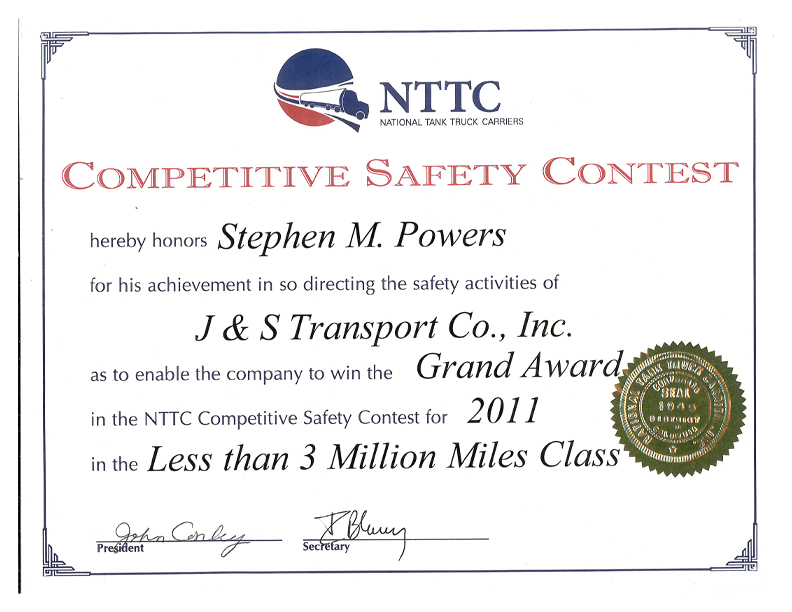 We at J & S Transport, have accident packets in each tractor and truck phones with installed digital cameras. This accident packet has all the information the Insurance Adjuster requires to set up the file. The camera phone provides the visual documentation to determine the extent of vehicle or property damage. 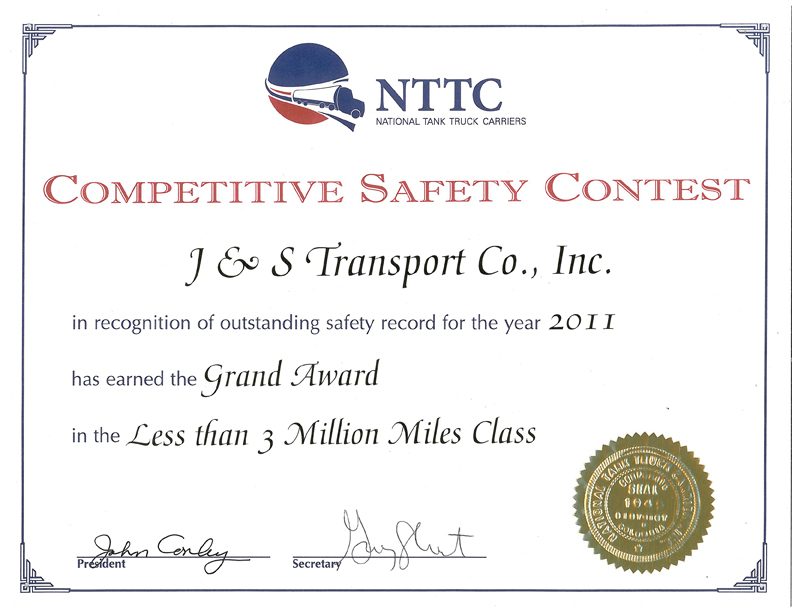 J & S Transport has specific procedures the driver must adhere to when involved in an incident. This is the only way we can protect the Company’s liability exposure from excessive, fraudulent and bogus claims. Regrettably, there are many unscrupulous Lawyers who use motor carriers as “Cash Cows”. They know how to manipulate the system to receive huge settlements for their clients involved in an accident with a commercial motor vehicle. Too often the motor carrier’s Insurance Company will settle with these Attorneys due not having sufficient information to defend that motor carrier in a Jury Trial. This is why it’s imperative drivers call me immediately when an incident does occur. You, the driver, do not have the authority to decide how the incident will be handled. You must call the Safety Director for guidance. Failure to do so can be disastrous to both, J & S Transport and our Liability Carrier, Federated Insurance. A bulk liquid petroleum delivery driver backs into a station to deliver a load of gasoline. As he backed, the rear of the tanker “taps” the above ground vent pipes from the underground storage tanks. The driver reported it verbally to the Dispatcher upon his return to the facility. In the heat of checking-in drivers, the Dispatcher forgot all about the incident. Several days later, the station reports strong fumes coming from the underground storage tank area. Their repair vendor investigated the source of the fumes discovering the vent piping on one of the underground tanks had been forcefully separated from a fitting to the tank allowing product to be released into the soil. After tracing their deliveries during that timeframe it was not difficult to identify the culprit. Needless to say, the cost of environmental remediation, fines from the State Department of Environmental Services, repair invoices and claims for lost business completely blindsided company management and the Insurance Company. Going through a rotary with other vehicles one dark and rainy night, the commercial motor vehicle sideswipes a passenger vehicle, a Mercedes Benz, taking off the side view mirror. Both vehicles pull off to the side of the road and look at the damage. The CMV driver gave the phone number of his company, instructing the passenger vehicle driver to call and they would pay for his mirror. Police were not called, the accident packet was not used or pictures taken and to cap it off; the driver forgot to inform the company of the incident. The company received a repair invoice from a Mercedes Benz body shop several weeks later in the amount of several thousand dollars for body repair and replacement parts, including side panels and doors. When the driver was queried about the incident, he admitted to being involved however stating it was just a broken mirror. A cold, dark, rainy night was not a good time to determine the extent of damage to both vehicles or did the extensive damage possibly happen elsewhere? The Insurance Company got caught holding the bag with the Motor Carrier having to explain itself during the loss run review during their liability policy renewal. A commercial motor vehicle driver is traveling in stop and go traffic. Not maintaining proper following distance, the passenger vehicle in front of him stops suddenly resulting in the CMV “tapping” the rear bumper of that vehicle. The driver of the CMV gets out of the cab and seeing no damage, drives away however, not before the driver of the passenger vehicle gets his truck info. The CMV driver made no mention of the incident to the motor carrier. The motor carrier receives suit papers from a Law Firm representing the driver of that passenger vehicle. The Suit Papers contend their client had neck surgery the previous month. The resulting whiplash received from this recent incident required further surgical intervention to address the repairs made in that initial surgery. The Suit further states their client experiences severe pain, unable to work and now requires extensive physical therapy and rehabilitation. The Suit is for all medical bills, lost wages and personal damages and of course, Attorney fees. The improvement opportunity is the same for each of these incidents; the driver made a decision they had no authority to make. Whenever an incident involves company property or employees, the Safety Director must be notified immediately. The Safety Director will determine the extent of liability exposure then decides on the required course of action. It is imperative every employee know the Company’s policies and procedures for accident reporting. Regardless of the perceived severity of the incident, it should always be treated as one requiring immediate attention from the Safety Department and the Insurance Carrier.